Microsoft Azure Blob Storage public and private containers can be used as origins with Fastly. TIP: With properly configured services in place, shared Fastly and Microsoft customers will benefit from Fastly’s integration with Azure’s ExpressRoute Direct Local, which results in Fastly including your outbound data transfer costs from Azure in your standard Fastly pricing. See our guide to outbound data transfers from Azure for more details. To make your Azure Blob Storage stores available through Fastly, follow the steps below. In the Name field, type any descriptive name for your service. In the Domain field, type the hostname you want to use as the URL (e.g., cdn.example.com). In the Address field, type <storage account name>.blob.core.windows.net. In the Transport Layer Security (TLS) area, leave the Enable TLS? default set to Yes to secure the connection between Fastly and your origin. In the Transport Layer Security (TLS) area, type <storage account name>.blob.core.windows.net in the Certificate hostname field. Type the hostname of your Azure Blob Storage account. For example, <storage account name>.blob.core.windows.net. In the Name field, type Modify URL. In the Destination field, type url. In the Source field, type "/<your container name>" req.url. Click the Create button. The new Modify URL header appears on the Content page. By default, we create DNS mapping called yourdomain.global.prod.fastly.net. In the example above, it would be cdn.example.com.global.prod.fastly.net. Create a DNS alias for the domain name you specified (e.g., CNAME cdn.example.com to global-nossl.fastly.net). In this example, no cache control headers are set so the default TTL will be applied. To use an Azure Blob Storage private container with Fastly, follow the instructions below. Be sure you've already made your Azure Blob Storage containers available to Fastly by pointing to the right container and setting your origin to port 443. This needs to be done before authenticating. Finally, you'll also need to know your Blob Storage container name. WARNING: Your account's Shared Key does not have detailed access control. Anyone with access to your Shared Key can read and write to your container. Consider using a Shared Access Signature (SAS) instead. To access an Azure Blob Storage private container with Fastly using a Shared Key, read Microsoft's "Authorize with Shared Key" page. 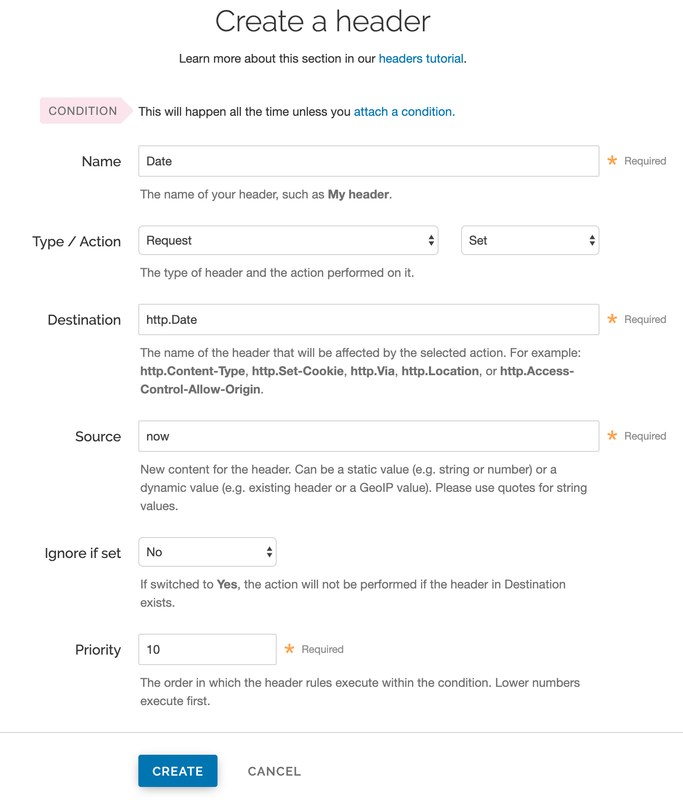 Then, create two headers: a Date header (for use with the authorization Signature) and an Authorization header. Create the Date header using the steps below. In the Name field, type Date. In the Destination field, type http.Date. In the Source field, type now. Click the Create button. A new Date header appears on the Content page. 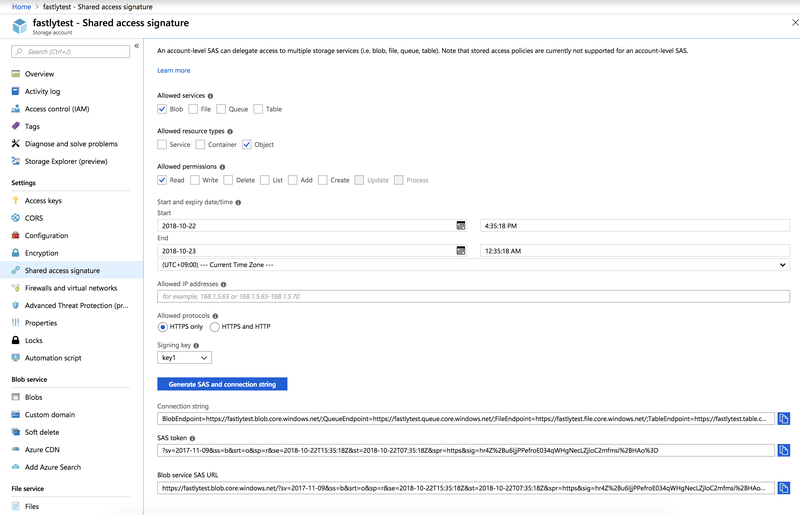 You will use this later within the Signature of the Authorization header. 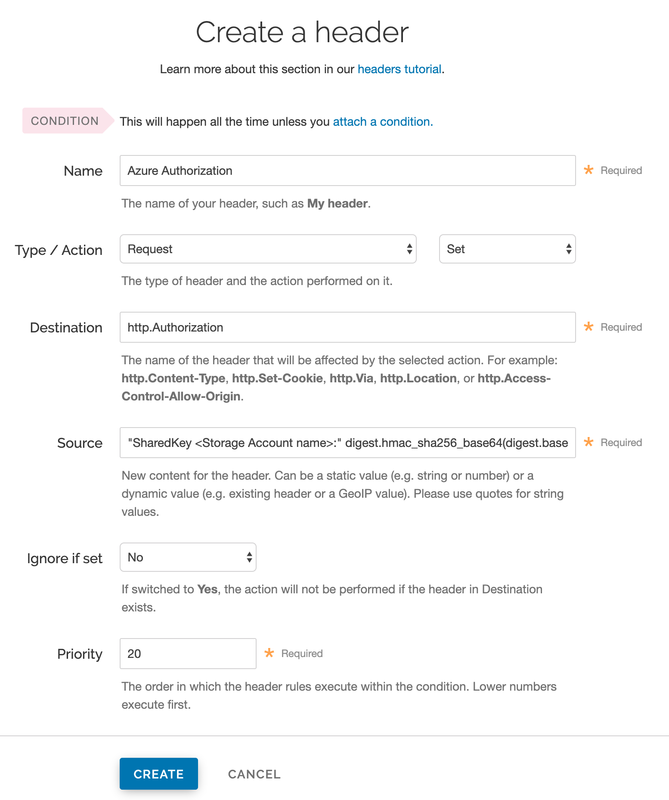 Next, create the Authorization header with the specifications listed below. Click the Create header button again to create another new header. The Create a header page appears. In the Name field, type Azure Authorization. 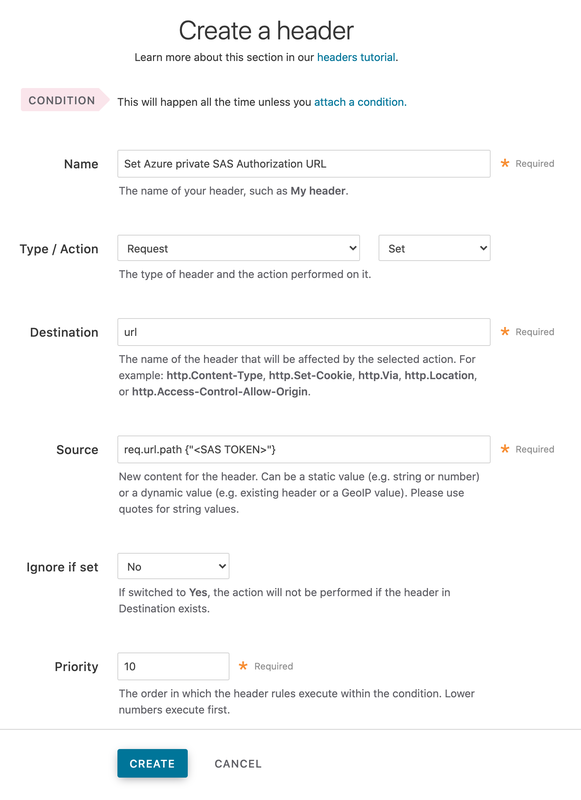 In the Destination field, type http.Authorization. In the Priority field, type 20. We provide a detailed look at the Source field parameters below. Click the Create button. The new Authorization header appears on the Content page. SharedKey A constant placed before the storage account name. It's always SharedKey. storage account name The name of your Azure Storage Account. We used test123 in this example. signature function The algorithm used to validate the key and message of the signature. We used digest.hmac_sha256_base64(<key>, <message>) in this example. key The Azure Storage Account shared key from your Azure Storage developer's account. We used UDJXUFN1NjhCZmw4OWo3MnZUK2JYWVpCN1NqbE93aFQ0d2hxdDI3 in this example. It must be Base64 decoded. message The UTF-8 encoding of the StringToSign. See the table below for a break down of each portion of the message. HTTP-verb The REST verb. We use req.method in this example. We rewrite HEAD to GET because Varnish does this internally before sending requests to origin. \n A newline indicator constant. It's always \n. Date The date and time stamp. We use req.http.Date (which we created first as a separate header in the steps above). CanonicalizedHeaders The x-ms headers, which customize your Azure Blob Storage implementation. It's often left blank. We use LF in this example. CanonicalizedResource Your Storage Account Name. We use "/test123" in this example. To access an Azure Blob Storage private container with Fastly using a Service Shared Access Signature (SAS), read Microsoft's "Delegating Access with a Shared Access Signature" page. Then, obtain the SAS and sign the access URL. The interval during which the SAS is valid, including the start time and the expiry time. Obtain the SAS using the steps below. Under settings navigate to Shared access signature. The Shared access signature controls appear. From the Allowed services controls, select Blob. From the Allowed resource types controls, select Object. From the Allowed permissions controls, select Read. Leave the Start time set to the current date and time. Set the End time as far in the future as you are comfortable (see note below). Ensure the Allowed protocols remain set to HTTPS only. Click the Generate SAS and connection string button. The generated information appears. We provide a detailed look at the Shared Access Signature parameters below. Next, sign the access URL by creating an authorization header following the steps below. In the Name field, type a meaningful name such as Set Azure private SAS Authorization URL. In the Source field, type req.url.path "<SAS TOKEN>" replacing "<SAS TOKEN>" with the token you obtained from the Azure Portal. Click the Create button. A new header appears on the Content page. Microsoft's "Constructing a Service SAS" page provides more details on shared access signatures and how they are constructed. sv The signedversion field. This is required and should be whatever the Azure portal provided. ss The signedservice field. This is required and should be b for "blob storage." srt The signedresourcetype field. This is required and should be o for "object." sp The signedpermissions field. This is required and should be r for "read only." st The signedstart field. This is optional and specifies, in a UTC format compatible with ISO 8601, the time at which the shared access signature becomes valid. If omitted, the start time for this call is assumed to be the time when the storage service receives the request. se The signedexpiry field. This is required and specifies, in a UTC format compatible with ISO 8601, the time at which the shared access signature becomes invalid. spr The signedprotocol field. This is optional and specifies which HTTP protocol (http or https) the container should use for access. We recommend https. sig The signature field. This is required and should be whatever the Azure portal provided. WARNING: Always keep track of the se expiry date. After it has passed, Fastly will not be able to access your private container.